We have LoNG-standing experience in liquefied natural gas. Marine Service has always been one step ahead when it comes to eco-friendly fuels such as LNG, which is becoming increasingly important across the globe. And in the LNG market, Marine Service has emerged as a global leader and a sought-after expert with decades of experience. We are true pioneers in this field. From LNG transport, we played a part in the development of the technology for ‘LNG as fuel’. We were instrumental in promoting the use of this eco-friendly fuel. In addition to this, we design and implement complex projects for the transport of liquefied gas and LNG supply. Pioneering Solutions – our strength. Feasibility studies, planning of LNG terminals worldwide and safety analysis since 1974. The development of 20% of the global LNG carrier fleet has been supported by Marine Service. The co-ordination of ship-shore-interface problems at both the loading and discharging terminal is another vital part of a reliable LNG shipping project and if not successfully solved, is very likely to cause serious and costly problems. 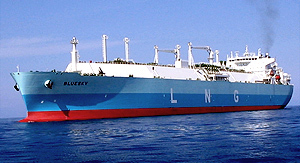 LNG is considered to be an eco-friendly alternative fuel. 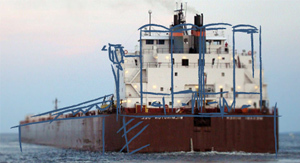 Marine Service develops optimal solutions for the fitting and refitting of vessels. Based on traditional LNG transport, we developed the first LNG tank container for ship operations in the world which is a dangerous goods container as well as a bunker. 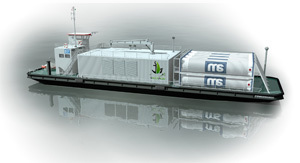 With its own propulsion and a quick change of LNG tank containers, our power barge allows flexible power supply at the port.